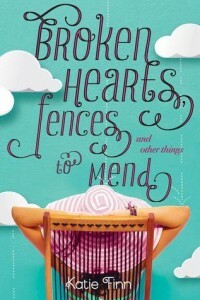 Broken Hearts, Fences and Other Things to Mend was such an amazing book, I don’t think I can wait until 2015 for the sequel! Revenge, forgiveness, betrayal and lies. Those four words sum this book up pretty well! Gemma was both an amazing character and a character I just wanted to yell at. At times, her actions were so frustrating, I just wanted to slap her or shake her silly until she listened to reason and common sense. In the beginning, I definitely thought she was a bit bratty and self-absorbed. She was also really immature in her relationship. Honestly, in the beginning, when she suffered certain embarrassing situations, I actually felt she deserved it. I lost some respect for her near the middle-end, but she sort of redeemed her self when all was said and done – what she did took a lot of guts. I would have liked to see more character growth in Gemma (maybe that will happen in the next book? ), but despite all my complaints, she was still a (mostly) likable and fun character. Of all the characters, I actually really loved Hallie. If I had to pick a character I could relate to the most, it would be Hallie. She was basically bullied and picked on by the girl who was supposed to be her best friend. Her life was almost ruined – her family’s whole reputation, in fact. I don’t blame her for being hurt and angry and upset. I even found it believable that she held a grudge for five years. If I’m being honest, in her shoes, I would have, too! I STILL look back to when I was in elementary school (and that was a LONG, long time ago) and I still wish I’d handled things differently with the girl who bullied me. Sometimes, I imagine that I stood up for myself back then and got back at her enough that she left me alone. Other times, I try to imagine what I would say if I saw her today. So I definitely found it believable that Hallie would still be angry after all this time. I would actually love to see some scenes from Hallie’s POV in Revenge, Ice Cream, and Other Things Best Served Cold (Broken Hearts & Revenge, #2). She really did end up becoming my favorite character! Now, I know we didn’t see a lot of Teddy… But I hated him and never liked how he treated Gemma. But Josh… I LOVED Josh. Until the end, of course, but I think he’s redeemable! But Josh was a gentleman, a hero, adorable and hilarious. He was a bit cheesy sometimes, but I just wanted to crawl into his lap and cuddle! Or… Uh.. Can we pretend he’s 18? No? Okay… Then… I wanted to stalk him from afar! He was just.. perfect. One scene in particular.. I don’t want to spoil you guys… But he was amazing, calm and collected, considering! I knew, almost from the very first “incident” that someone was behind it… And I had a feeling I knew who that was. I also had a hunch about who a certain person was. And I also had a feeling a certain person knew more than they were letting on… And I know that’s all extremely vague and I’m kinda rambling. But my point it, I totally guessed all the twists in this book, starting around page 45. And every hunch I had? I was right! Now, I always have the same issue when this happens – I’m both excited that I was right and a little let down that it was so predictable. But in this case, with this particular book, I was REALLY excited to be right! Overall, though I wasn’t a huge fan of Gemma or certain elements of the story, I really enjoyed this book. I found I couldn’t put it down and, when I did have to, I could think of nothing else but picking it back up! I was DESPERATE to know who was behind the “embarrassing situations” Gemma found herself in (though my hunch was correct!). I’ve never finished a book and been THIS DESPERATE for book two! Like.. I need it now, please and thank you! Katie Finn is an amazing writer and I’m definitely going to check out the rest of her books, including the ones written under her alter-ego, Morgan Matson! And I HIGHLY recommend this book, in case that wasn’t clear! The vagueness is just perfect enough to make me want to find this book. And that you were desperate to find out who was behind the “embarrassing situations.” I have a feeling someone is going to get it good in book 2, and the title begs to be read. Who doesn’t like revenge? When you read it, I hope you love it!! :) I’m dying for book two! I really liked Broken Hearts. I like Gemma and Hallie too because I actually understand where both of them are coming from. I couldn’t properly root for either of them because I think they’re both right and wrong. But I really liked this book so much! I knew what was happening from the start too. I just had a feeling and after everything kept happening, I just knew it. Totally agree! Both were right in their actions, yet both were wrong and they both have a LOT to learn. Loved it! This is the first review I’ve read for this book and I’m glad that you kept it a bit vague, so not to give up any surprises up for the rest of us! It sounds super interesting and the title for this book and book 2 seriously are amazing! I tried to be vague but still make sense.. Hope I did! This was a tough review to write! Hope you love it if you read it!